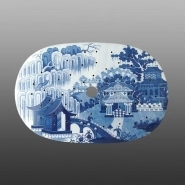 An earthenware well and tree platter with matching drainer printed in blue with the Ornate Pagodas pattern. The pattern contains three ornately decorated pagodas with C-scrolls and other western motifs. The platter is of a unique design because the "well" is within the rim of the piece and is much narrower than most. The drainer is shown below. Woolley pieces were rarely marked, making this example of considerable note.